The English journalist G.K. Chesterton said, "Education is simply the soul of a society as it passes from one generation to another." With our fast-paced society, schools are adapting and flexing to find a way to do just that. Here we have compiled a list of the most affordable online Master's Degrees in Education throughout the United States. It is clear from the list that state schools have heavily invested in online degrees of this kind and every single school on the list is indeed a state school. Of course, this provides for some interesting decisions when it comes to rankings since some schools have an in-state and out-of-state tuition differentiation for their programs. Therefore, we ranked schools based on the lowest tuition available. Although this is the case, out-of-state tuition is often very reasonable and some schools allow out-of-state students to apply for an out-of-state tuition waiver. An online Masters in Education can help teachers gain more skills within their discipline, provide opportunities for specialization certificates, and increase their pay. Western Governors University, located in Texas, is a fully accredited online University. It provides a Master's Degree in English Language Learning, Mathematics Education, and Science Education (Physics, Chemistry, and Geoscience) as well as Master of Education Degrees in Instructional Design and Learning and Technology. The variety of teaching degrees and emphases give students the opportunity to find a niche and specialize in their field. Further, there is only one tuition level, with no out-of-state penalty. Western Governors University is accredited by the National council for the Accreditation of Teacher Education (NCATE). West Texas A&M University offers a Master of Education in Curriculum and Instruction, Reading Education, and Special Education. Each option is a program tailored to the needs of the various emphases with common components such as Multicultural Education, Human Development and the like. The faculty for this program is drawn from four of the on campus departments, giving the program a decidedly interdisciplinary core. In terms of its position in the list, it is placed as 9th in affordability because it's in-state tuition level but West Texas A&M's out-of-state tuition level is impressively not much more. West Texas A&M University is accredited by the Southern Association of Colleges and Schools Commission on Colleges (SACSCOC). 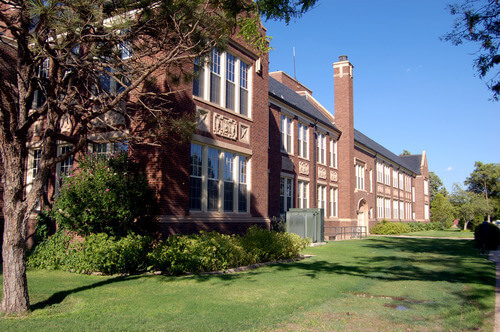 Montana State University Northern offers a Master of Education Degree with an emphasis in Counselor Education as well as a Master of Science in Education, Instruction, and Learning. The program, while not the cheapest in state tuition, has a decent out-of-state cost and provides a rather unique program in the Counselor Education degree. As with the other schools on this list, Montana State offers a degree with the backing and respect of a state school and is accredited by the Northwest Commission on Colleges and Universities (NWCCU). University of North Alabama provides online Master's Degrees in Elementary Education and Secondary Education. The Secondary Education Master's Degree offers certification in biology, business marketing, chemistry, English as a Second Language, English language arts, general science, general social science, history, mathematics, music-choral, music-instrumental, physical education, and Spanish. Further, North Alabama offers a Master's Degree which they call an Alt A Degree. This degree allows those who do not have a Bachelor's in Education to pursue a Master's in Teacher Education and to further pursue certification. University of North Alabama is accredited by the Southern Association of Colleges and Schools Commission on Colleges. University of Wyoming provides online Master's Degrees in Curriculum and Instruction and K-12 Educational Leadership. Courses within the Master's Degree include courses in curriculum, instruction, assessment, multicultural education, and educational research. Further, students can develop specific areas of specialization. Graduate students can also earn a graduate minor in Educational Research through Wyoming's Professional Studies department. In state tuition is $5,504 while out of state tuition is $13,802. The University of Wyoming is accredited by the Higher Learning Commission. Bemidji State University, located in Bemidji, Minnesota, provides an online Master of Arts in Teaching. The program is intentionally flexible so that those who want to pursue interdisciplinary study can do so. Although this is the case, there are opportunities to focus on areas of interest and for the student to have an area of emphasis, especially if they wish to teach within the context of a particular discipline. The degree costs around $5,375 a year with the possibility of tuition waivers and stipends for graduate assistantships. Bemidji State University is accredited by the Higher Learning Commission of the North Central Association of Colleges and Schools. University of Texas at Arlington offers a Master of Education in Curriculum and Instruction with an emphasis in Literary Studies, Mathematics, or Science Education. These three options provide unique opportunities for educators to expand their knowledge and skills within their own classrooms. The Literary Studies program provides opportunities to develop skills as a Reading Specialist, in English as a Second Language, or to become a Master Reading Teacher. Their online program is accredited by the National Council for Accreditation of Teacher Education (NCATE). A public college located in Hays, Kansas, FHSU offers an online master of science in education with emphasis areas including chemistry, English for speakers of other languages, mathematics, and reading specialist. All programs require a total of 33 credits, divided between an education core and a specialization core. The 15-credit education core covers topics such as utilization of technology, education research, cultural diversity, and instructional design and assessment. The 18-credit subject core includes a variety of courses: reading specialist majors, for example, complete courses such as literacy development, content area reading, trends in language arts, and clinical reading diagnosis and remediation. Based in Cullowhee, North Carolina, WCU offers a master of arts in education with specializations in either elementary or middle grades education. Both pathways require a total of 30 credits, split between a 12-credit professional core and an 18-credit concentration core. Courses cover a variety of topics, including curriculum development, teaching methodology, child and educational psychology, research skills, and content area knowledge. The elementary education major offers tracks in STEM, literacy, or academically and intellectually gifted education, while the middle grades education major offers tracks in STEM, math, or language arts/literacy. The program prepares graduates for teacher licensure from the North Carolina Department of Public Instruction. Eastern New Mexico University provides an online Master's Degree Program in Elementary Education and, at the in-state tuition level, beats the competition in terms of affordability hands down. The program provides those in Elementary Education knowledge in best practices in curriculum areas which include reading, math, and educational technology. The in-state tuition is around $4237 a year while the out-of-state tuition is around $11,596. Although this is the case, if a student takes 6 units or under per term and are out-of-state, they are charged the in-state rate. Their online program is accredited by the National Council for Accreditation of Teacher Education (NCATE).